Singapore is not just a little red dot - it is also a lush garden city. Look beyond the window and you would see the integration of greenery into our modern urban development. NParks is largely responsible for our City in a Garden's greenery. It manages Singapore's green spaces and environment - a challenging feat considering the country's scarcity of land amid rapid development. In spite of many competing land uses, NParks maintains and enhances our green identity by coming up with novel ways to 'green up' our urban spaces. One such example is the NParks Skyrise Greenery Incentive Scheme, the objective of which is to boost efforts to 'green up' buildings vertically. In Singapore, over 60 hectares - an equivalent of 84 football fields - of green roofs have been installed in more than 500 buildings! Contributing to NParks' work is NParks Scholar Thaddaeus Cheng. As a Manager in the Streetscape department, Thaddaeus helps to manage the urban greenery along road verges in Singapore. This includes conducting tree inspections and other tree-management work to ensure the health and structural stability of trees. He also works closely with landscaping contractors, as well as colleagues from other departments and agencies to design and implement various planting schemes. He adds, "A recent initiative that I am fortunate to be a part of is the enhancement of greenery for selected MRT stations. It has been extremely rewarding to work with agencies such as LTA to implement such a comprehensive strategy - one that maximises all available space such as covered link ways, external walls and roofs." Thaddaeus' scholarship gave him the opportunity to pursue the Bachelor of Science in Ecology and Environmental Biology at Imperial College London, UK. While he was there, he secured an internship with a Swiss-based Non-Governmental Organisation. The internship gave him the chance to spend two months in a remote area of Western Tanzania, placing and retrieving camera traps out in the forest to collect research data. Thaddaeus is also part of a research team that guides the development of greenery policy management through integrated research in Singapore. One research project involves geospatial analysis and statistical modelling to better understand the relationship between tree structure and weather. Another studies the changes in the composition of the urban forest, allowing for targeted planting efforts to maintain a healthy and diverse balance of tree species. "Such projects help to improve the stability and diversity of the urban forest which NParks has worked hard to bring about," he muses. 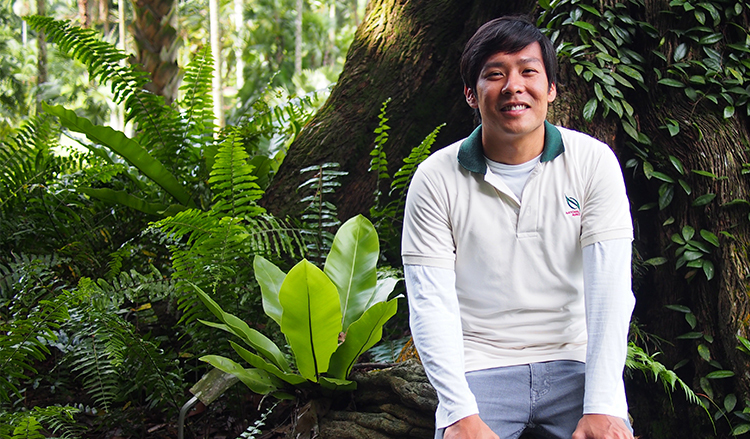 Like many NParks staff, Thaddaeus prides himself on his contributions to the country's green development. He shares, "As I go about my day-to-day business in Singapore, I derive a great sense of satisfaction from taking some time to enjoy the environment - and knowing that I played a role in creating it. "Furthermore, all NParks departments are united by a common vision. I hope to work in other departments in future to gain a more holistic understanding of the organisation. This will definitely enable me to contribute more to growing our City in a Garden."